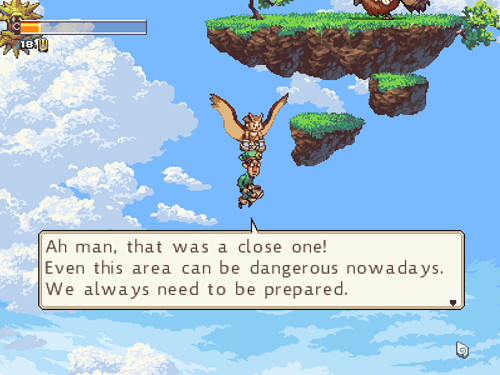 At long last, after eight years of development, Owlboy is nearly here. Owlboy, from D-Pad Studio, is a game about a student owl named Otus who wears a cloak that allows him to fly. The world in which he lives is made up of a series of floating islands, which has recently come under attack by sky pirates. Otus has set out on a quest to stop the sky pirates and save his home village of Vellie. But in order to do this, he will need some help. Otus is a more-than-capable platforming hero – especially given the fact that he can fly freely – but he is lacking in offensive abilities. He has a spin attack that knocks enemies back, and he can pick up items such as rocks and toss them at the baddies, but he has no projectiles of his own. To assist him in this department are a number of gunners that can be carried through the environment, and the player is able to use them to aim and fire in any direction.